Main Street Claremore is partnering with the City of Claremore to conduct urban acupuncture, small scale intervention to transform the larger urban context, through Alley Activation 2025. This project was launched following a public survey conducted by the group to measure interest in the project, and to gauge support if efforts were made. Jessica Jackson, Main Street Director, stated that by activating the alleys improvements are provided toward public safety, downtown beautification, engaging public spaces, green corridors, celebrating local visual and performing arts, and enhancing and expanding the pedestrian network. In addition to these areas, a feasibility study was completed by Finley Engineering in May 2018 to determine the ability to reduce the utility infrastructure that is currently overhead. To launch the project, John Hammer of The Hammer Studio will paint a mural on the South wall of North Block COMMON. You can find the artwork for this in the photos above. If you are interested in becoming involved on the committee leading this project, contact Jessica Jackson at mainstreet@claremore.org or 918-341-5881. The impact of Claremore as “Museum City” was the subject of last week’s discussion at the Claremore Collective Think Tank, with a trio of local museum experts serving as special guests for the discussion. Wayne McCombs, Tad Jones, and Andy Couch with the J.M. 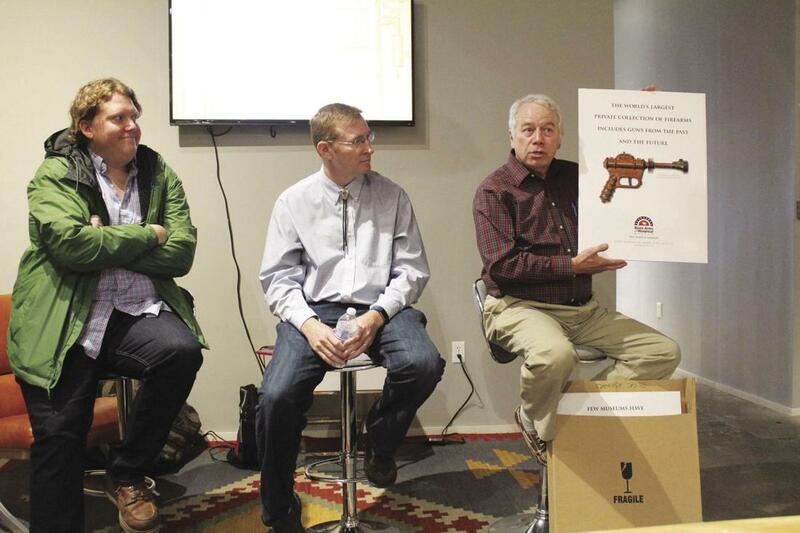 Davis Arms & Historical Museum, the Will Rogers Memorial Museum, and Claremore Museum of History (MoH), respectively were on-hand for the meeting of local entrepreneurs. 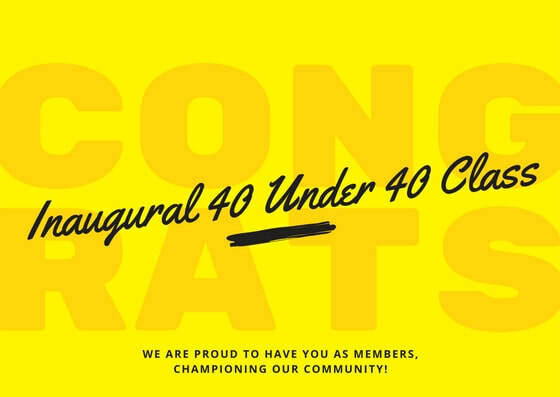 “First of all, Claremore Collective is a group of young professionals who have come together to help facilitate good conversations to help expand the constituents and people who live here in Claremore’s minds to see the bigger picture of making Claremore a better place,” said Jerrad Coots, Claremore Collective. “During my time with the Collective and the various Think Tanks we’ve held in the past, my mind has been opened to the many things that help make Claremore tick, and all the things that contribute to make Claremore grow, chief among those is tourism. Claremore Museum of History Director Andy Couch was the first to speak. “I took this job (as Claremore Museum of History director) at the end of November 2017, and was meeting everyone in town,” Couch began. “I visited each museum and met Dr. Danette Boyle, Tad Jones, and Wayne McCombs -- I’d actually read one of Wayne’s books on baseball before we met, so it was awesome to get to meet him in person. At each museum I visited we all discussed doing something together — a joint program or exhibit, and when I got to talking to Tad, and Tanya Andrews at Visit Claremore we felt the same way, and we soon began to look at how we structured tourism of the museums here in Claremore. “Out of that, the Claremore Museums Coalition — including all four museums — developed, and the town was branded ‘Museum City’,” he said. “Most everyone has heard of Will Rogers, and I had too, growing up here my whole life,” Jones began. “We all knew how big he was, that he was in movies, but not a lot of people know that his very first talking movie was shot down here by the Gazebo, back when it was a dirt road. People of this generation may not know that in his day, he was the number one movie star in America, and in his last movie, ‘Steamboat Round the Bend’, the name of the steamboat was ‘The Claremore Queen’ -- the whole country was seeing Claremore because of Will Rogers and what he was doing at the time. McCombs concurred with Couch and Jones’s assessment of the city’s museums as being key in attracting tourism dollars to the city. “We’re fortunate that we all get along — it’s great for all of us in that what’s good for Tad’s museum is good for me, what’s good for Andy’s museum is good for Tad’s and so on,” McCombs said. “What’s great for one of us is great for all of us, and what’s great for all of us is really great for Claremore. Even if a person has been to the museums before, we’re always doing something new — new exhibits, new activities, so I’d encourage them to just come by and see what’s different. “Each of us is more than just what people may think of us as being. Claremore Museum of History is much more than just old photos — it’s amazing, the number of people who have come from Claremore to go on to worldwide fame,” he said. “The Will Rogers Memorial Museum is much more than a statue of Will and some old newspaper clippings — Will Rogers was the most popular man in the world in his day, he probably could have been president if he’d wanted to be but he stayed humble and kept close to his roots, which were in Claremore, and the gun museum is more than just a collection of old weapons -- it’s the largest privately-held collection like it in the world. Following McCombs’s remarks, he, Jones, and Couch answered questions from members of the Claremore Collective. We were beyond humbled to participate in this incredible event, and want to say thanks to the nearly 50 volunteers partnering with us! This truly exemplified so many groups coming "Together for the City"! Thank you to Tour de Dirt for allowing Claremore to host Shoreline Shred TDD Race! A huge shoutout to Josh Froman, Mike Ward, David Steward and Brandon Irby for kicking the trails intitiative off -- and to Trail Boss, Rory Peterson for keeping the party going. We appreciate the many work hours from all to make our trails some of the best in the state! With 197 adult racing participants, and many more kids and families, the Happy Lake Campgrounds and Claremore saw hundreds of visitors this weekend. Adventure Signs made us look good, while Musician's Haven kept us entertained with great music on the trailer provided by Auto Definitions, and Billy Sims BBQ for donating a delicious lunch! Collaborations with the City of Claremore Government Parks & Rec department, Rogers County Commissioner Dan DeLozier, Rogers County Sheriff's Office and Arts & Entertainment Co-Crew Leader Jenni Bruner made this event a major hit! Thank you to everyone for your hard work and dedication showcasing the gem Claremore is! The Arts & Entertainment Crew hosted another SOLD OUT Culture Crawl! The first of 2018 featured Barron Law Firm Building renovation, Fortna CPA's building renovation, as well as an art showcase with PS Gordon and live music with The Lonelys. These events will continue to take place featuring more great art, with an exclusive element each quarter! ​Over eighty young professionals, elected officials and inspired community members attended Claremore Collective’s Launch Party Thursday night at the Will Rogers Memorial Museum. Leaders of the young professionals group celebrated the successes found within their first twenty-four months as an organization, as well as introduced their new leadership team, and outlined its focus for continued progress in 2018. Matthew Ballard, District Attorney for Oklahoma District 12, will lead the group as chair in 2018, in addition to Danialle Munroe, Director of Marketing for Pelco Structural, serving as chair-elect. Both shared their appreciation for the many individuals within the community leading by example to elevate the priorities of young professionals. The group announced its recent establishment as an independent 501(c)3 nonprofit organization, operating its second year solely from private donations. Claremore Collective is made up of five crews: Arts & Entertainment, Attraction, Development, Government Relations, and NextGen Leadership. Those interested can participate in as few or as many of the crews they desire. During its first twenty-four months, the organization celebrated success within their key interest areas including the Mountain Bike Trails, Downtown Development, and West Bend Green development. The trails have expanded from 4.25 miles to over 11 miles from organic volunteer efforts. Collective also celebrated the elevation of its Make Your Mark campaign areas, Downtown and West Bend Green District development, announced in January 2018 as a part of the city’s strategic visioning plan, Claremore Dreams 2025. “While programming is targeted to those ages 21 - 45, those young at heart are also welcome to join. Monthly Mixer happy hours are a great way to get a foot in the door, and meet others from the area,” said Meggie Froman-Knight, executive director of Claremore Collective. For more information about the organization, or how to get involved, visit www.claremorecollective.com or its Facebook, Instagram and Twitter pages. Cherie Davis, Senior Health, Safety & Environment Specialist with Baker Hughes, a GE Company, shared the theirinnovative culture to approaching safety. All Baker Hughes, a GE Company, employees are tasked with individually being responsible for a perfect HSE day. This means for any given day there were no recordable injuries, illnesses, significant spills or releases, or significant motor vehicle accidents. Employees work as a team to ensure everyone has ownership in HSE, as a new way of thinking. Through hazard identification, control, understanding and following processes, managing change, and sharing lessons learned each department can ensure a perfect HSE day is achieved. Employees are also empowered to stop work at any time if they feel the environment is unsafe. By using an interdependent safety culture, cooperation occurs not only within but across the team, with increased organizational pride. Management can be comfortable leading, or empowering team members from their area to lead. Overall this leads to a team fully engaged in goal setting and improvements. This Think Tank session was sponsored by RCB Bank. Josh Kunkel, Architect with Crafton Tull, presented a case study review of both local and nationwide districts. He began with the importance of a unified look and brand to distinguish the area. Some examples include the Kansas City Power & Light District, The Broken Arrow Rose District and the Dallas Arts District. The branding of a district is important to tie into the details of a place. For example the Blue Dome District is implementing domed light fixtures with blue LED lights on the top to further communicate boundaries. He did point out that Strong Towns recommends that place comes first because decorative lights without a place is just bling without a soul. Kunkel presented a number of data points reviewing how places were built including commuter patterns, travel times, home ownership rates, and migration between rural and suburban areas. He recommended that districts can be named from a number of elements including namesakes, architecture, products, ethnicity, and geography. One example of geography would be the West Bend District near the Will Rogers Memorial Museum, Claremore Expo and Rogers State University. This is a bend on the west side of town. Walkability and parking was another key discussion point. Kunkel argued it is important to create awareness and experiences so that you can begin to shift cultures toward putting walking in perspective. He compared a Walmart parcel to that of downtown Goergetown, being equal in size. However, it is not always considered from this manner. Finally, Kunkel argued that having a cornerstone to anchor your downtown area helps drive the success allowing districts to thrive. The Claremore Collective crew is ready to hit the Arkansas River again for the Great Raft Race. For the second year, the Collective has constructed a raft to enter in the race's Pokie Okie contest. The race is held Labor Day weekend and historically has drawn thousands of participants and spectators. The Collective's race team, called the Jolly Rogers, is excited to represent Claremore. Meggie Froman-Knight said it was exciting to participate in a project that gets everyone's creative juices flowing in a new way. This project is a fun way of showing off local resources and talents. "Hydrohoist donates the pontoon, which is a huge help," she said. "It's been a learning opportunity for us, learning the process of how these are made. And this is a manufacturer that we have in our own backyard." She said the team has spent between 60 and 80 hours on the project—not to mention the off-site work like graphic design and drafting blueprints. With a project of this scale, she said everyone had a chance to shine. For this crew, the project is about more than just building a raft, more than just participating in a race. "We're all really excited about being a part of the Great Tulsa Raft Race again this year. 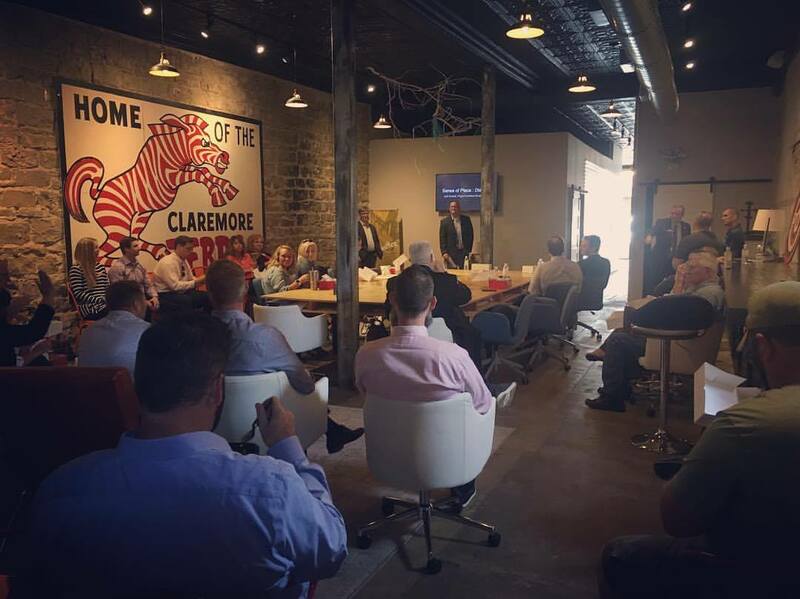 Young professionals in the Claremore area came together to form Claremore Collective in January of 2016. We are a group of people who share at least one thing in common: a passion for Claremore. We are all involved in our community and have always built relationships with each other through our shared passion, but participating in the Great Tulsa Raft Race is a chance for us to grow together in more of a fun and relaxed environment," Jake Krumwiede said. "And, with our participation in events like the raft race, we are representing Claremore in the greater Tulsa area, showing people that, while Claremore is small compared to places like Tulsa, it is still a great place to live." Another Collective member, Matt Ballard said “we’re definitely going for style points on this one. I think people will like the raft we’re putting together. Ballard said he is impressed by the talent found within the group—and the sense of camaraderie. Every sea vessel needs a captain—of the Jolly Rogers, that hat belongs to Brian O'Dell. Technically, O'Dell is serving as the Raft Race Chairman this year. The crew agrees he's been an integral part of keeping the project moving in the right direction. O'Dell said HydroHoist gave them a great base to build from, and he's happy his own business, Blue Arc Metal Specialties, had space and tools available to host the building portion of the project. "Everyone has their own skill set and ideas and we threw it all together," he said. "We went over the top and had a few cool ideas. We recently all pitched in and got a ship's wheel that will be operational and tie back to the rudder so one of us will be at the helm driving this thing down the river." O'Dell said watching the design come together was fun, but the fellowship was his favorite part, just watching everyone come together. "We are going to take it to Claremore Lake for a dry run, or wet run rather, before race day," he said. No matter how they do in the race, Krumwiede said it's been a fun ride. Originally printed in the Claremore Daily Progress by Carolyn Ashford, Publisher, on Sunday, August 13. The Claremore Progress announces a Tuesday public forum to honor 35 individuals and five power couples, all 40-years-old or under, who are Rogers County’s driven, successful business and community leaders. The winners will be honored with a public reception to be held on Tuesday, Aug. 15 at 320 on Main from 4 p.m. until 6 p.m. Among the speakers at the event will be Cong. Jim Bridenstine, Pelco President Phil Albert and Frank Robson, owner of Robson Properties and past chairman of the Board of Directors for RCB Bank. The reception is sponsored by BancFirst, Robson Properties, RCB Bank, City of Claremore, Peloc and the law firm of Taylor, Foster, Mallett,, Downs, Ramsey & Russell. In January 2017 at the State of the City, Jim Thomas, City Manager announced near completion of the priorities and goals set forth as a part of the City's strategic plan through 2020. He also shared the City would begin a new visioning process called Claremore Dreams 2025. The visioning process to develop Claremore Dreams 2025 is set to take place over nine months with eleven milestones, announcing the results of the data captured at the January 2018 State of the City. August marks the fourth month of the process, with six of the eleven milestones met. The process began with hosting multiple focus groups with City Department Heads, City Council, RSU Administration, Executive Roundtables and a Civic Partner Luncheon. The City is asking for citizens to help develop, find ownership and champion the vision behind Claremore Dreams 2025. They are seeking input by traveling into each of the four wards, hosting town halls. These sessions will be a time for the city to listen to input that will help drive the strategic plan for the next eight years. They are open to the public, even if you do not reside within that particular ward. All are encouraged to attend, as well as invite others. The upcoming town halls are open to the public, even if you do not reside within the ward. RSVP links can be found below. A copy of the presentation slides from the Think Tank session can be viewed here. Updates from Claremore Dreams 2025 can be subscribed to here.